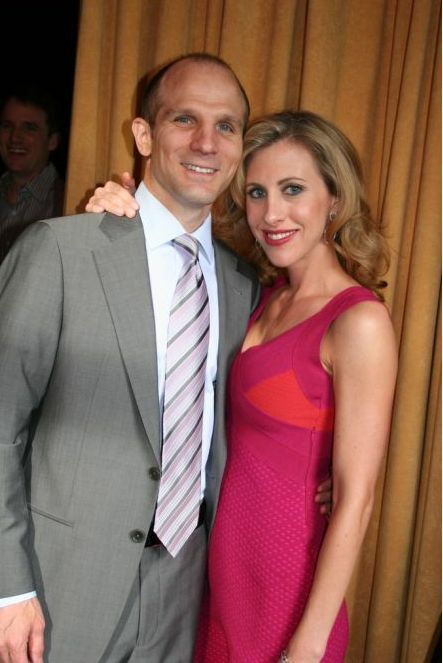 Also, the drama surrounding Emily Giffin's husband and Amazon reviewers kept me entertained last night. You can read all about it here. 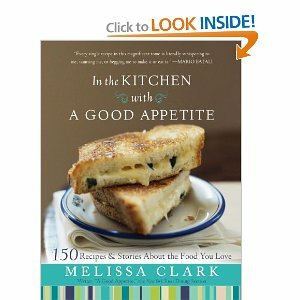 ﻿I enjoyed her latest book- it made for excellent entertainment to listen to while performing my daily chores. And I agree with the controversial reviewer that it was nice to read a book of Giffin's which did not glorify cheating! A nice fluffy read. Hmmm, what else? I recently read "Dare Me" by Megan Abbot- one reviewer described as "the Secret History meets Pretty Little Liars", an odd combination which sounded right in my wheelhouse. Stellar author credentials, a good New York Times review, and . . .I didn't like it. It felt like it was trying too hard, and used vagueness as a way to ineffectively add suspense. None of the characters appealed to me, or felt fleshed out at all. You win some, you lose some I suppose. 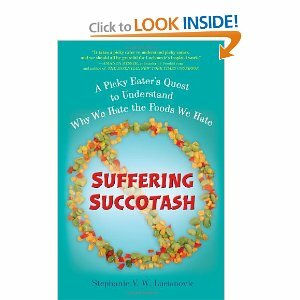 I am currently enjoying Suffering Succotash , a look at picky eating by a recovered picky eater. As y'all might know, as someone who eats everything, picky eating fascinates me. The book is an excellent mix of fluff and fact. So, that's what's on my brain. What do y'all think about the Emily Giffin kerfuffle? Interesting, no? I think her camp comes off a little immature, but I could see how her husband was hurt on her behalf and blindly jumped to her defense. She should not have gotten involved though. . .
Have y'all read Dog Shaming? It's hysterical. Buddy is definitely in the running for an appearance. For example, there was yesterday. I had just gotten back to sleep after dealing with Miss Priss, when I heard frantic barking.﻿ It was a Snoopy alert. Buddy loves everyone and everything. Except Snoopy. a) Snoopy is a dog's name. Not a damn cat. It's like naming a dog Garfield. Just wrong. b) SNOOPY!!! GET OUT OF MY YARD!!! I guess he is Buddy's Newman. It's pretty entertaining. Just not at 4 AM. So many people have inquired about Dell Harper's prolific eating habits, so I thought I would do a brief post on Baby Led Weaning. 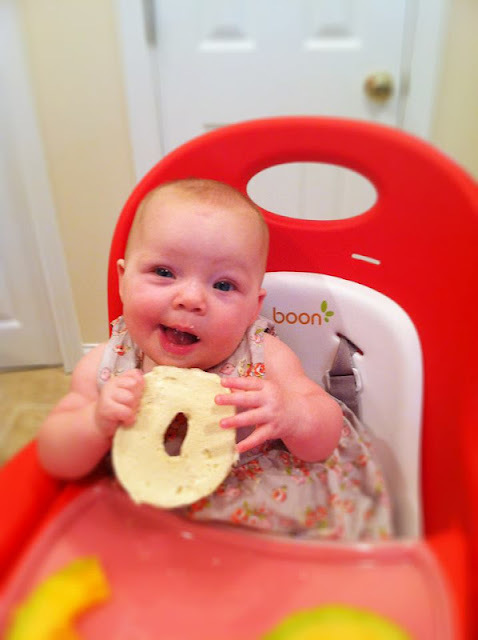 We began about a week shy of her six month birthday, after a brief attempt with rice cereal to combat her reflux. After hearing about BLW from Kate, I was immediately intrigued, ordered the book on my Kindle, and began my compulsive research. Counting the days until her six month birthday, I was thrilled when she grabbed a piece of cantaloupe off my plate at the pool. 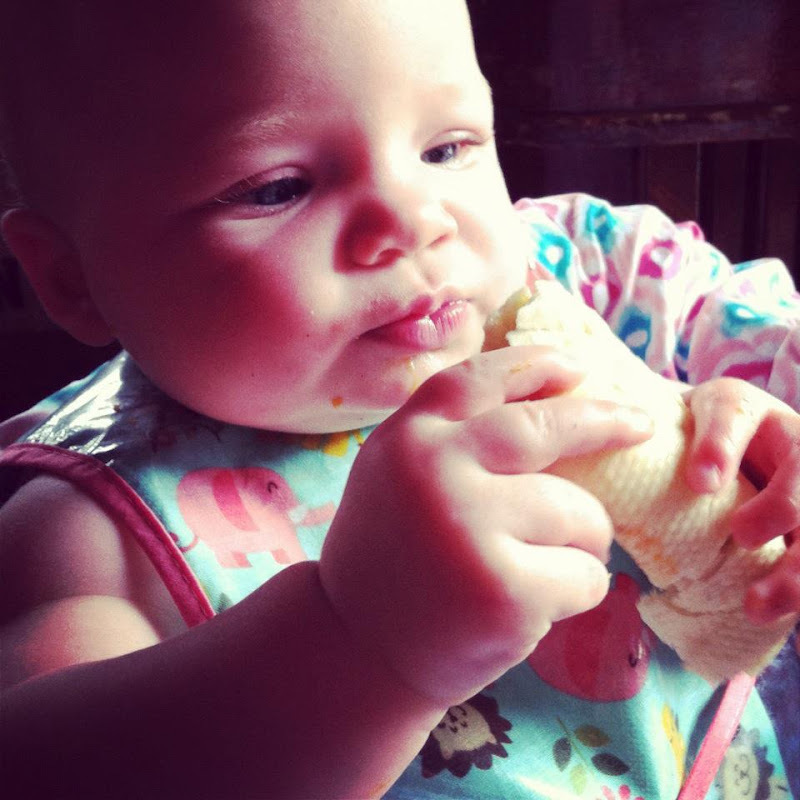 We let her gnaw on it, and I spent the afternoon daydreaming about what to try next. I started with carrots- just a big old bag of organic full size carrots. I trimmed the ends, and left the peel on for gripping purposes. Steamed to extreme softness, I tested them by pretending I had no teeth and gnawing. Luckily there were no witnesses to this experiment. Dell Harper immediately picked up the carrots and stuck it in her mouth. It was a huge hit! And mess, but that is what baths and dogs are for, right? My parents laughed that my bathtub is going to get stopped up like Kramer's shower when he washed his produce in there from all the veggie residue rinsed off Miss Priss. Avocado was next- I left the peel partially on, to allow for gripping. 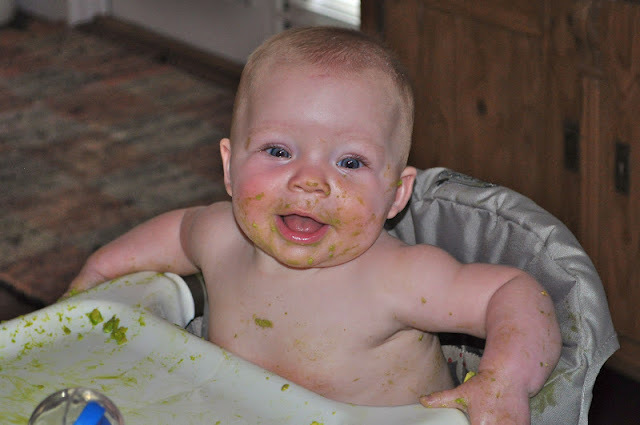 This was a bit of a mess later when I discovered a large piece of avocado peel in her diaper. Oops. We tried avocado a couple weeks later sans peel and Dell Harper gave herself a moisturizing avocado mask in addition to eating it. She has gnawed on some more cantaloupe- I started the chewing for her. Sweet potato wedges roasted with cinnamon with the peel left on worked well (more peel in the diapers was discovered). 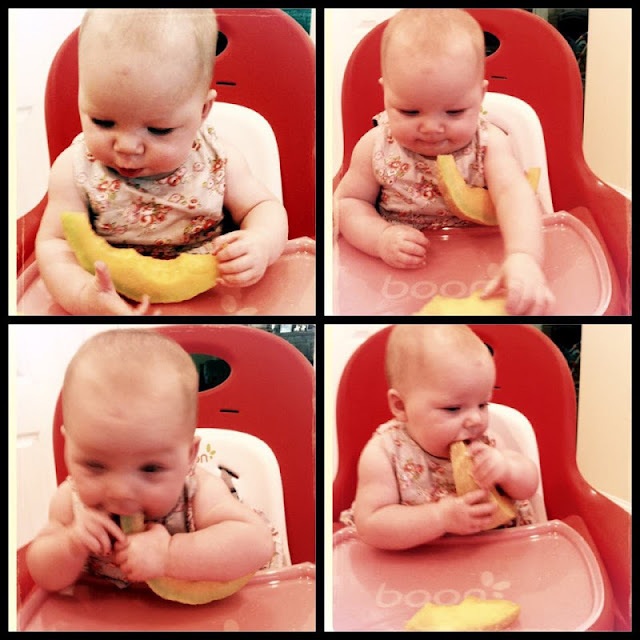 She also tried bananas down at the beach, which were a messy delight (although backed up her little system a bit (sorry for all the diaper talk!)) Once again, I left the peel on so she cut hold the banana. I cut it in half lengthwise, then let her go, periodically trimming the peel. Another tip I heard is to roll the slippery stuff in Cheerio dust to help the holding. Her favorites? BROCCOLI! She loves to hold the stem and eat the florets. This is my favorite as well. 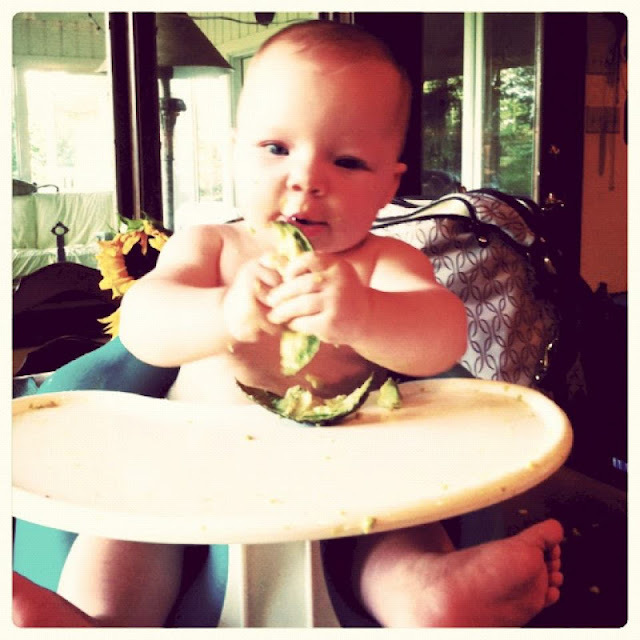 The mess is not as bad as avocado or banana, and the florets seem like they pose little choking hazard. Her other favorites? Any kind of bread. She loves French bread- I scoop out the soft middle and give her the crust (the soft bread can gum up and become a choking hazard). I gave her a frozen bagel to help with teething (Miss Priss got 2 on our vacation, did I tell y'all that?). She took down the bagel! Whole wheat frozen waffles were also popular. The bread at Red Bar kept her quite occupied. So far, it's been super fun and much easier than spoon feeding purees. There are a multitude of advantages, but my favorite part is the entertainment factor. 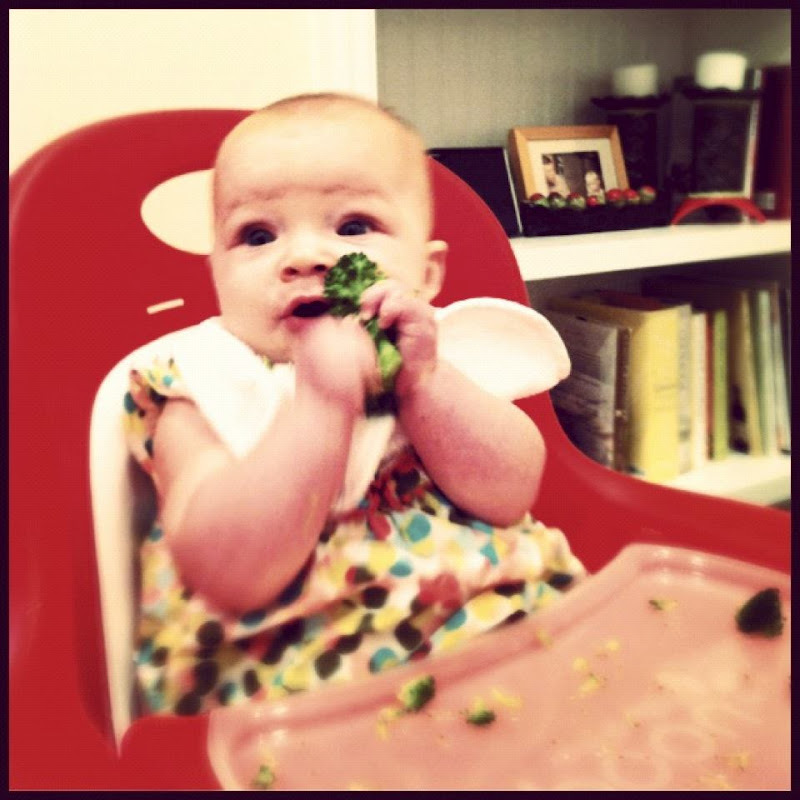 She loves sitting in her high chair eating with her family. Tonight as we ate with my parents, brother and SIL. 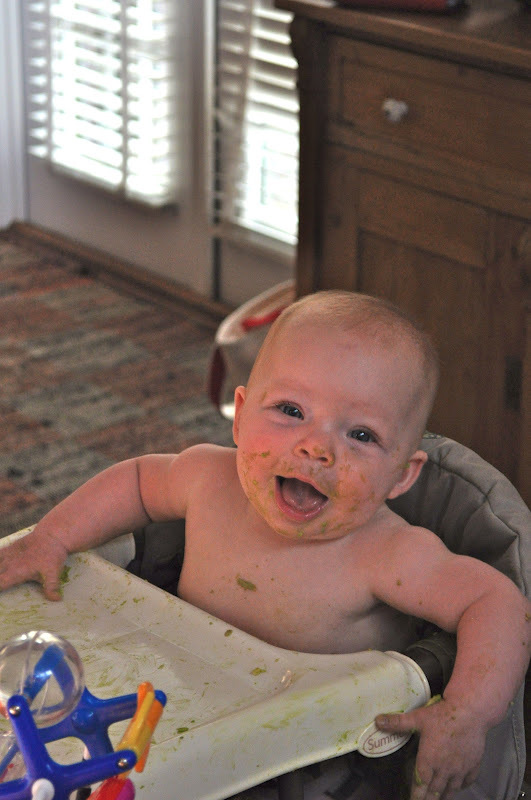 Dell Harper happily munched carrots and zucchini while we enjoyed lasagna and zucchini. Now for the downside. All my reading talked about how gagging isn't choking, and warned against hovering, yet emphasized watching the child eat. I shrugged off this part, thinking "I won't worry about choking. I realize that she will be fine, yet won't leave her alone." Hmmph. I watch that kid like a hawk. I am on edge every meal. It doesn't help that she will get over enthusiastic, shove food in her mouth, then dramatically gag and cough. It is terrifying, and Hubs HATES it. Although we both know as long as she is making noises she is fine, it still scares the bejeezus out of me. It didn't help when her pediatrician was not very enthusiastic about this process at her last appointment, and warned about choking potential. This merited a stern look from Hubs to me. However, this fear is definitely receding as she gets better at eating and gets teeth! I will also relax a bit when she develops her pincher grip and gets bite-sized pieces of food in the next couple of months. 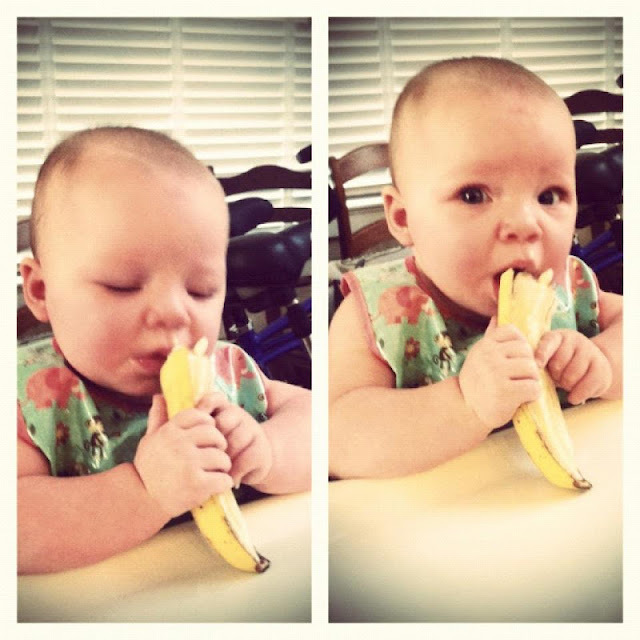 Some babies don't gag and choke, so please don't let that deter you. We are starting slow- dinner a few nights a week, and now lunch as well. She is eating milk for nutrition, and I think of the solids as an added bonus. I am going to start adding in some variety, and dairy and meat in the next few weeks. So, that is our BLW experience so far. I'd love to hear your experiences with solids, and answer any questions (ha, about the beginning stage obviously!). Look how big my girl is! I am feeling much better after 10 days down at the beach. Note to self- if you don't wear your retainer you get gaps. I'm going with the character-adding aspect because I'm never having braces again. Miss Priss loved sitting up in the sand and watching the waves. My brother and sister-in-law (reality- my lovely SIL) surprised me with a birthday flower and champagne delivery. It was an excellent companion to fried oysters and shrimp from the Seagrove Market. And birthday crabcakes at Red Bar. 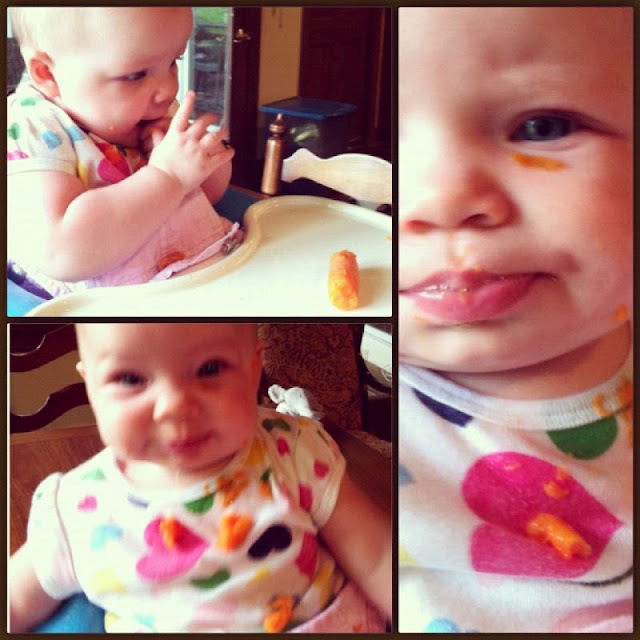 Dell Harper enjoyed a roll or two, and her first high chair experience. We were joined by some dear friends and their four month old for the latter half of the week. The baby girls did a lot of staring at each other. And even a little hand holding in their matching suits. I am still dying over the cuteness. I am finally on the road to recovery. That nasty cold turned into an even nastier sinus infection, which left me completely laid out last week and the beginning of this one. Thanks to antibiotics I am feeling much perkier. (Yay, for drugs!). Due to the lack of movement, I have been tearing up my Kindle, so it's high time for some book recommendations, don't you think? "Cristina Alger's glittering debut novel interweaves the narratives of the Darling family, two eager SEC attorneys, and a team of journalists all racing to uncover-or cover up-the truth. 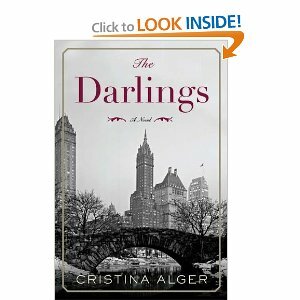 With echoes of a fictional Too Big to Fail and the novels of Dominick Dunne, The Darlings offers an irresistible glimpse into the highest echelons of New York society-a world seldom seen by outsiders-and a fast-paced thriller of epic proportions." I stole that description (as all the others), the aforementioned antibiotics and cold medicine have rendered me unable to write book reviews. 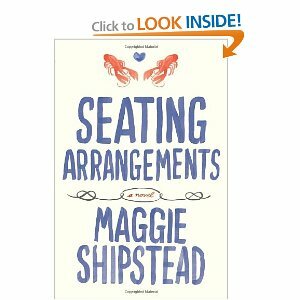 I just finished Seating Arrangements and wholeheartedly enjoyed it. 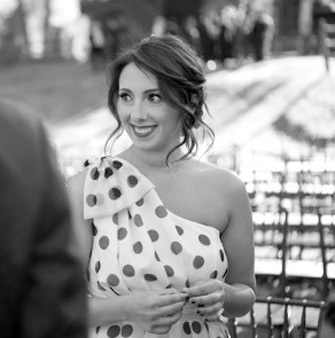 "Maggie Shipstead’s irresistible social satire, set on an exclusive New England island over a wedding weekend in June, provides a deliciously biting glimpse into the lives of the well-bred and ill-behaved. Winn Van Meter is heading for his family’s retreat on the pristine New England island of Waskeke. Normally a haven of calm, for the next three days this sanctuary will be overrun by tipsy revelers as Winn prepares for the marriage of his daughter Daphne to the affable young scion Greyson Duff. Winn’s wife, Biddy, has planned the wedding with military precision, but arrangements are sideswept by a storm of salacious misbehavior and intractable lust: Daphne’s sister, Livia, who has recently had her heart broken by Teddy Fenn, the son of her father’s oldest rival, is an eager target for the seductive wiles of Greyson’s best man; Winn, instead of reveling in his patriarchal duties, is tormented by his long-standing crush on Daphne’s beguiling bridesmaid Agatha; and the bride and groom find themselves presiding over a spectacle of misplaced desire, marital infidelity, and monumental loss of faith in the rituals of American life. " I love Shipstead's writing voice, and descriptions. Her description of the father's reaction of the multitude of females wandering through the house in various state of undress rang so true- you know those beach trips where some people are jus wandering in, sweaty and sunburned, other girls are fresh from the shower with towel turbans, and then the smug fully blow-dried and made up gals lounge with evening drinks? She nails it. 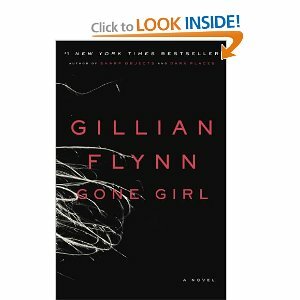 Like so many of you on the interwebs, I devoured Gone Girl, by Gillian Flynn. I actually listened to this on my IPod, and the two narrators were fantastic! 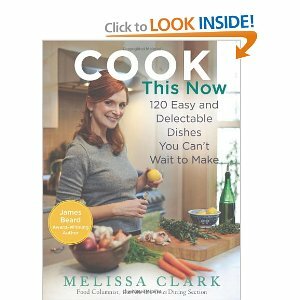 If you are looking for an audiobook, try this!
" With her razor-sharp writing and trademark psychological insight, Gillian Flynn delivers a fast-paced, devilishly dark, and ingeniously plotted thriller that confirms her status as one of the hottest writers around." This next one is a bit quieter, but an excellent and intelligent novel that I could not put down. 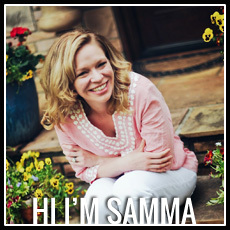 "Kate Moore is a working mother, struggling to make ends meet, to raise children, to keep a spark in her marriage . . . and to maintain an increasingly unbearable life-defining secret. So when her husband is offered a lucrative job in Luxembourg, she jumps at the chance to leave behind her double-life, to start anew. 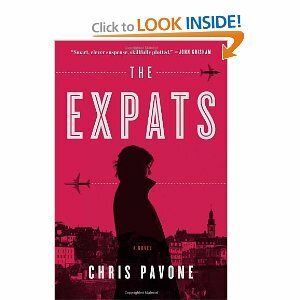 Stylish and sophisticated, fiercely intelligent and expertly crafted, The Expats proves Chris Pavone to be a writer of tremendous talent."